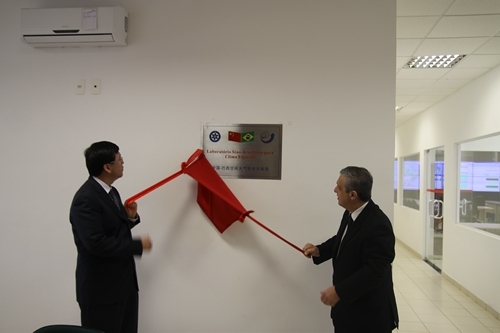 Jointly established by the Chinese Academy of Sciences (CAS) and the National Institute for Space Research of Brazil (INPE), the China-Brazil Joint Laboratory for Space Weather,also known as the CAS Laboratory for Space Weather in South America, will play a key role in the International Space Weather Meridian Circle Program (ISWMCP). As an extension of the Meridian Project, ISWMCP is designed to connect the 120-degree East longitude and 60-degree West longitudechains of ground-based observatories in order to enhance China's ability to monitor the space environment worldwide. Furthermore, ISWMCP aims to understand and reveal the physical processes behind catastrophic space weather events and develop space weather forecasting models with the help of spaceborne observations. The China-Brazil Joint Laboratory for Space Weather is responsible for ground-based observation along the meridian chain and data convergence in the Western hemisphere, as well as joint space environment exploration and research in low latitude areasin both the Eastern and Western hemispheres. In addition, it will also serve as a bridge for Sino-Brazilian cultural exchange and further scientific cooperation. The proposal to construct the China-Brazil Joint Laboratory for Space Weather was officially approved by CAS in 2013 and was included in the CAS International Research and Education Development Program. In June 2013, a delegation led by ZHOU Wenneng, deputy minister of the Ministry of Science and Technology, visited INPE. A bilateral agreement was sign by Prof. WANG Chi, deputy director of NSSC, and Prof. Perondi, director general of INPE. In December 2013, during the Third Meeting of the Sino-Brazil High Level Coordination and Cooperation Committee, Mr. MA Xingrui, head of the China National Space Administration (CNSA), and Mr. Jose Raimundo, president of the Brazilian Space Agency, signed the 2013-2022 Space Cooperation Plan between CNSA and the Brazilian Space Agency. The signing ceremony was witnessed by Mr. WANG Yang, deputy prime minister of China, and Mr. Michael Temer, vice president of Brazil. The China-Brazil Joint Laboratory for Space Weather hasbeen designated a top priority cooperative project between the two countries. Construction is scheduled to begin in 2014 and the lab is expected to become fully operational in 2016.